Man, I hate writing these posts. I'm glad to help, of course, but I hate that there's still people out there stealing beloved vintage cars. Lately, we've seen a lot of old Beetles stolen — I got lucky, of course, but let's see if we can help again. This one is a teal blue '66, stolen from Hawthorne, CA. Buddy, I know the feeling. 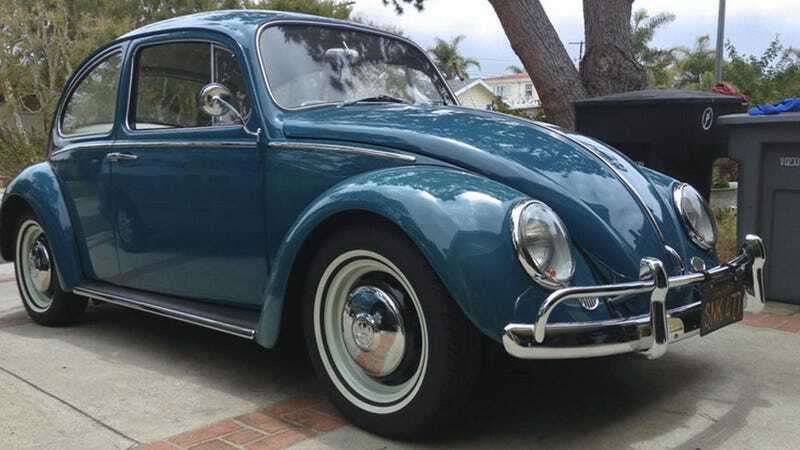 This '66 is in really lovely shape, and '66 may be my personal favorite VW year, too. The '66s had a number of one-year only details that may make it easier to spot— '1300' on the engine lid, flat hubcaps on 5-lug rims with narrow cooling slots, and a 1-year only 50 HP 1300 engine. This particular one seems to have its front indicators shaved off, and an amber bulb in the headlight housing acting as the turn signal. This wasn't stock, so it's a detail that may help. I'll keep an eye out, of course, and I know our terrific Jalopnik community will as well.